We Will Help You Design The Room Of Your Dreams! With the best possible product at the best price available. Through the beauty, quality, and excellence of Clearview sunrooms, you can enjoy your home’s outdoor world free from mosquitoes and other nasty bugs, unpredictable or extreme weather conditions, and harmful UV rays. 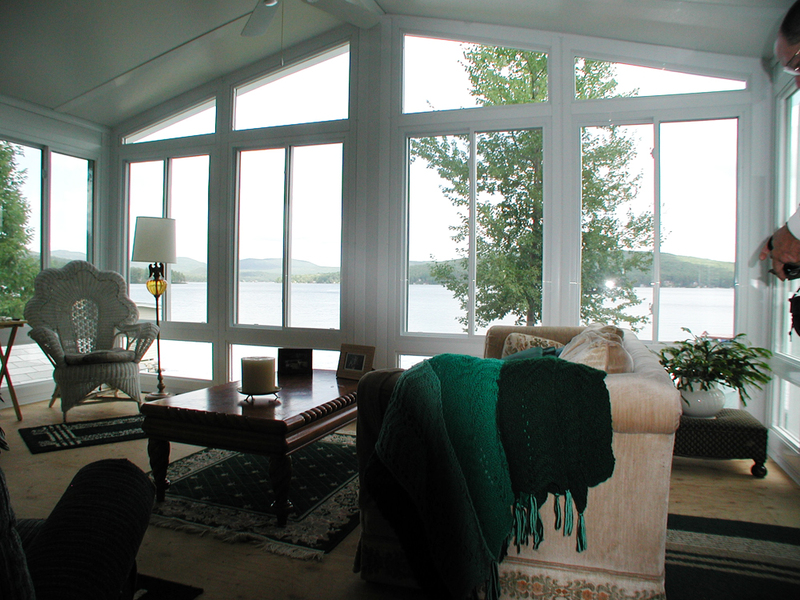 A Clearview sunroom will extend your home’s living space and also increase its overall value. Precision engineered for today’s lifestyles, Clearview products take you to the next level of comfort and technology, with seasonally adaptable rooms for any style of home or geography. Feel free to take a tour to see which style is right for you! All-Season Sunrooms are custom built to owner specifications. Engineered for strength and long life using aluminum extrusions, first choice window and door units and insulated aluminum structurally integrated wall and roof panels. Wall modules and roof panels are factory painted, featuring maintenance free baked enamel finish. No construction mess! The sunroom is manufactured as a kit in our factory which greatly reduces the amount of usual on-site construction mess. Site installations are much quicker than conventional construction. Generally a one to three-day project installation. The windows and doors are available with or without colonial white gridded glass. The grids are concealed within the panes of thermal glass. An All-Season Patio Room is manufactured with sliding glass wall panels and doors offering a better view and more daylight. Also available in any other style window option, Double Hung, casement, etc. Imagine enjoying the beauty of the outdoors in the comfort of your new Clearview outdoor living space. Clearview carries Three-Season Sunrooms with a 1” , 2” or 3” wall thickness. The very popular Standard Three-Season Sunroom with 1” walls features four styles of window options and two door options. 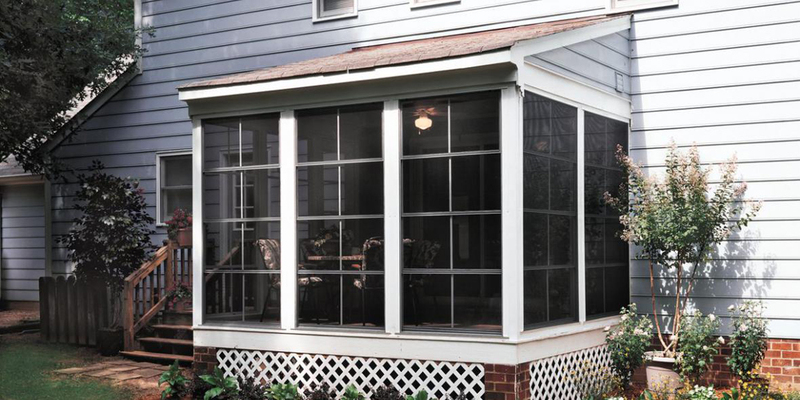 The Deluxe Three-Season Sunroom features a 2” wall and four styles of window options. 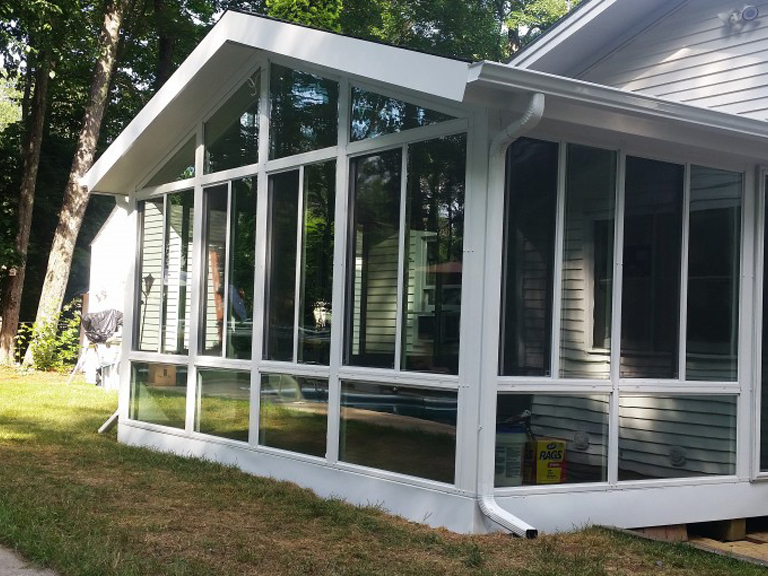 The Premier Three-Season Sunroom also with a 2” wall thickness featuring vinyl clad insulated thermal Low E windows and residential doors with or without white colonial grids. Choose from two styles of screen rooms. 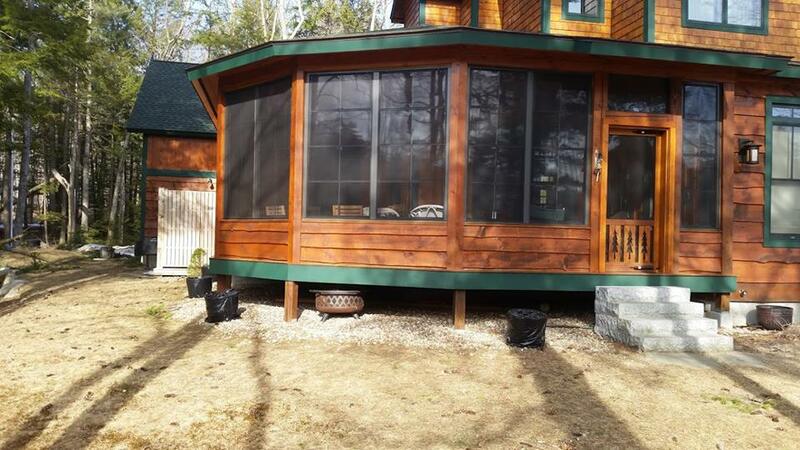 The Full-Screen Room or the Deluxe Screen Room which features an easy conversion to a Three Season sunroom with the addition of windows available in four styles. Both you and your friends will get special enjoyment from the time you spend in your Screen Room. Our rooms offer large screened areas to offer a pest-free, bright, airy, casual atmosphere. Add an insulated roof and your screen room will be the coolest! Our rooms offer large screened areas to give you a pest-free, bright, airy, casual atmosphere. The Full-Screen Room is designed to offer large screened areas to optimize your view and allow the breeze to blow thru. Built with a 12” knee wall and a horizontal mullion bar providing strength and durability. The Full-Screen Room is the lowest priced screen wall system for home improvement. The Deluxe Screen Room features an easy conversion to a Three Season Sunroom at a later date with the addition of windows available in four styles from Dura-Bilt. This room gives you extra privacy with the higher base panel a 24″ knee wall. The fiberglass screen is factory installed in the painted aluminum frames to give you years of carefree use. 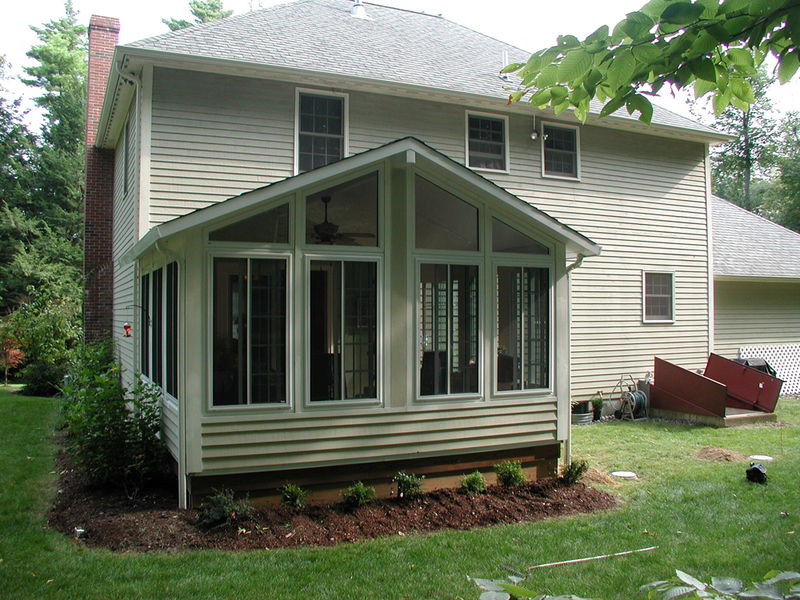 Not quite sure that you like the looks or design features of a sunroom addition? Well, we can help with that too. We can build you a traditional stick built addition that matches the existing architectural design of your home. 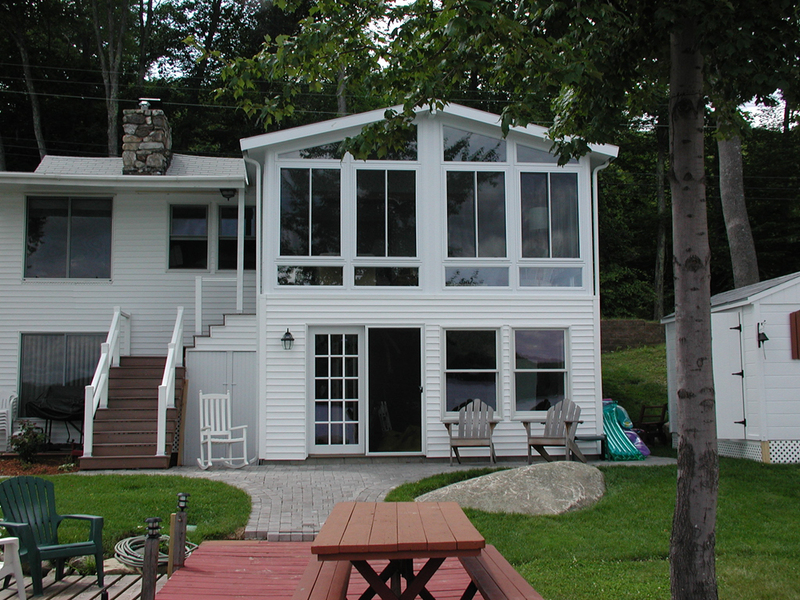 With siding and roofing to match and traditional windows the same as your existing home. The only difference is we use SIP (structural insulated panels) panels to build your addition. This dramatically cuts down on construction time and mess as your room will be done within weeks as opposed to months like regular construction, and of course, the faster build time will save you money as well. The design possibilities are endless.